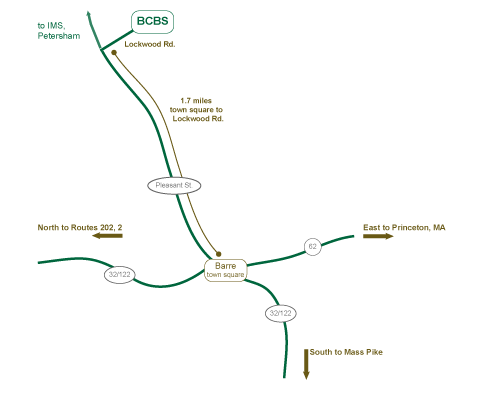 BCBS is located in central Massachusetts, about 2 miles north of Barre center. By car, we are 50 minutes northwest of Worcester, MA, 2 hours west of Boston and about 4 hours north-east of New York City. There is no public transportation service directly to Barre. Take Route 122 North to Barre (approximately 22 miles). Then see “From Barre Town Common” below. Take Route 2 West to Gardner (exit 22). At traffic circle, take Route 68 South to Route 62 (approximately 9 miles). Then take Route 62 West to Barre (approximately 7 miles). Then see “From Barre Town Common” below. Take I-90 (Mass Pike) to Auburn (exit 10). Take Route 12 South, then Route 20 West, then Route 56 North. Turn off at Route 122 North (left) to Barre. Then see “From Barre Town Common” below. Take I-91 to I-90 (Mass Pike) East to Palmer (exit 8). Take Route 32 North to Barre (approximately 25 miles). Then see “From Barre Town Common” below. Take Route 2 East (exit 27 off I-91) to Route 122 South (exit 15). Follow 122 South to Barre Center (about 18 miles). As you approach the Barre Town Common, turn left onto Pleasant Street where Route 122 makes a sharp right. Don’t take this right turn. Then see “From Barre Town Common” below. Follow Route 122/32 North through Barre center and past Barre Library on your left. Just after this, continue straight onto Pleasant Street. You will be leaving Route 122/32 at this point. Proceed 1.7 miles along Pleasant Street. Turn right on Lockwood Road (you will see a rock with BCBS carved on it). The BCBS Farmhouse is at the end of Lockwood Road, about 1/4 mile from Pleasant Street. If you can offer a ride to or from BCBS, or are seeking a ride, please visit the Ride Share page, available to anyone confirmed at IMS or BCBS. You are welcome to preview rides needed or offered. However, if you’d like to post a ride, you will need a password, which will be included in your confirmation email. The Ride Share can also be used to coordinate group van sharing arrangements with the limousine services shown below. Then take a taxi to BCBS with Worcester Yellow Cab. They provide a 24-hour service from Worcester to Barre. You can contact them at 508-754-3211. Easy Going Car Service offers a direct service between New York City and BCBS. Travel to and from other points throughout New England and New York is also available by private reservation. Rates, reservations, and additional information is available here. Major airlines fly into Boston’s Logan International Airport, the most convenient location for onward transportation to BCBS. Knight’s Airport Limousine Service provides a similar service to Barre. Knight’s also offers a discount for AAA members and senior citizens. Call 800-822-5456 or book online. Reservations are recommended at all accommodations. Deposits may be non-refundable. The B&Bs and campground are within a 5-20 minute drive from BCBS; the motels are a 30-40 minute drive.